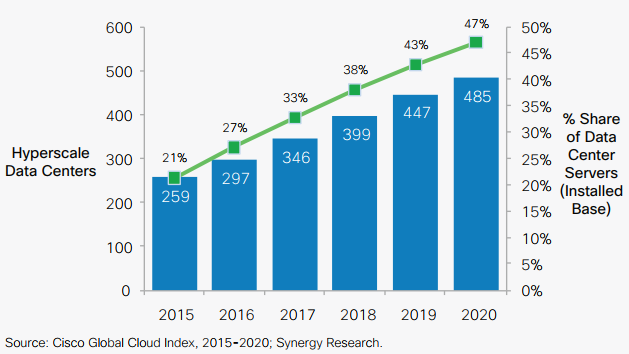 According to findings from the latest Cisco Global Cloud Index (GCI), cloud service traffic is expected to rise 3.7-fold -- that’s up from 3.9 zettabytes (ZB) per year in 2015 -- to 14.1 ZB per year by 2020. By 2020, data center storage installed capacity will grow to 1.8 ZB -- that’s up from 382 EB in 2015, or nearly a 5-fold growth. By 2020, the total global installed data storage capacity in cloud data centers will account for 88 percent share of total DC storage capacity -- that’s up from 64.9 percent in 2015. Globally, the data stored in data centers will quintuple by 2020 to reach 915 EB by 2020 -- that’s up 5.3-fold (a CAGR of 40 percent) from 171 EB in 2015. Globally, data generated by IoT will reach 600 ZB per year by 2020 -- that’s 275 times higher than projected traffic going from data centers to end users/devices (2.2 ZB); 39 times higher than total projected data center traffic (15.3 ZB). Learn more about the shift to hybrid cloud. Frank De Gilio describes his approach - Guerrilla warfare with hybrid cloud.